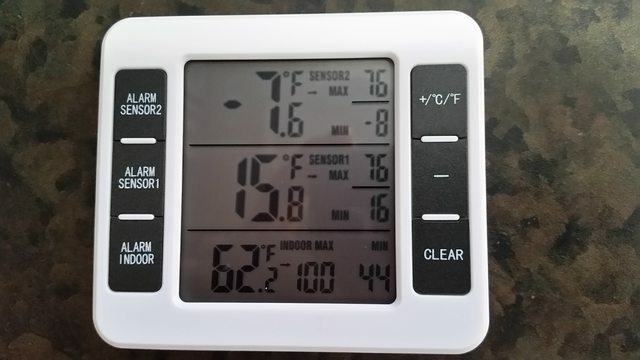 So what temperature readings do you get if you switch to electric? What kind of shape is the refrigerator door seal in? Does the condensate drain tube have a restrictor or S-bend in it to reduce air infiltration? It cools fine on electric but when applying the extra heat of the gas it actually cools less. Below is a picture of the reading while on electric for 12 hrs. The coils in the back were much warmer than they are after running on gas for 48 hrs. The door seals are good all around and the drain tube has a restrictor. The gas flame and elecric element both heat the same chunk of metal. Your electric readings show your cooling unit is working. All comes down to the fact that you aren't getting enough heat to transfer from the burner flame to the boiler. My next guess would be a missing or rusted out flue baffle. Does yours have the spiral thing that goes in the flue to help retain heat in the boiler? If this is missing, I can see how it would cause your problem. The baffle was in there and very rusty. I cleaned all the rust off with a drum sander on my Dremel. I did find a specification after I had already reinstalled it that specified a 1 7/8 inch recess to the bottom of the baffle from the bottom of the flue. I did not measure this because it was already running. I have turned it off now so it is cool enough to measure. It seems odd that that measurement would be critical but I will check it. I know that the flue for the propane burner is welded to the same boiler as the pocket for the electric electrode but for some reason the heat from the gas flame is not heating up the flue as intended. The insulation and the metal holding it has not been disturbed and looks as new. I wonder if it is possible to get a bad weld by a beginner that is mostly slag or do you think they are welded by robotics that don't make mistakes. I guess I can check to see if a new baffle is available. Maybe the tolerance is too great on the sides of the old baffle and the heat does not linger long enough. I know when it is running, I can reach my fingers up to the top of the flue tube and there is a lot of heat coming out. It will burn you in a hurry. I guess I can check to see if a new baffle is available. Maybe the tolerance is too great on the sides of the old baffle and the heat does not linger long enough. I know when it is running, I can reach my fingers up to the top of the flue tube and there is a lot of heat coming out. It will burn you in a hurry. Only thing that really seems plausible to me. Maybe if you can measure the diameter of yours vs. the diameter of the flue and then compare to the diameter of a new one. Also, check the position in the flue. I want to run something by you guys that a fellow was telling me about my fridge not cooling. We were at an RV rally and I got to chatting with a fellow RVer. When I described the strangeness of this fridge cooling good on AC and very poorly on propane and all I had done to make sure the propane side was functioning properly, he had a theory and a fix. He thinks that the fact that this rig sat unused for an extended period that the solution inside the cooling unit separated out by settlement and blocked or partially blocked the tubes feeding the boiler. Enough solution is passing the blockage for the electric element to heat and cause a circulation to occur but when the extra heat of the gas is applied, it boils the boiler chamber dry because the solution cannot feed the chamber fast enough and it basically becomes vapor locked. He claimed that the blockage in the system can be cleared by removing the fridge and up-ending it and letting it stand upside down for several hours, at which time I would reinstall it and start it on gas. I was hoping someone here has heard of this before as an accepted thing to do or am I being led on a "snipe hunt"? How are you making out with your problem? I'd try a new orifice before giving up. If somebody stuck something in it, they probably damaged it. Or somebody replaced it with the wrong one for your unit. This isn't just a chunk of brass with a hole in it. There's a man made ruby that's laser drilled inside. At least verify you have the correct #58 orifice in there.